It took nine whole months (duh! 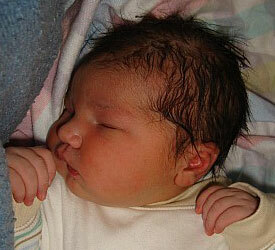 ), but finally she’s here, John & Esme’s brand new daughter Alice. Yesterday John sent me an email with some photos and a short video of the newborn girl and her mother, but of course I couldn’t blog about it before he did! This entry was posted on Saturday, April 14th, 2007 at 2:22 am	and is filed under Uncategorized. You can follow any responses to this entry through the RSS 2.0 feed. Both comments and pings are currently closed. Hi Els. Hope all is well with you.